One of the Germans that I work with is a retired sergeant with the Bundeswehr (German Army) Reserves. His unit was participating in a Schützenschnur marksmanship qualification event and invited me to join them. Sweet! I was one of about five Americans there, along with several German (obviously), Belgian, and Dutch troops. There was even a group there from Switzerland. And they brought their knives! Fun fact: The Swiss military have to sign out their uniforms if they are leaving the country and return them promptly after returning due to Switzerland's neutrality policy. So, back to the marksmanship event. While technically only for enlisted soldiers, officers can be awarded the badge but can't wear it on their uniform. It can be awarded in Bronze, Silver, or Gold and foreign troops (like me) can earn it. The other Americans and I spent the day rotating between the three firing positions: pistol, light weapon (rifle), and heavy weapon (machine gun). It was kind of confusing, but I kept close to my German friend to make sure I didn't miss a section. And it was good that I did, as there were actually two parts to the machine gun portion. I started off with the pistol, which I'm most familar with. Not this particular model, however. The double-action was much stiffer than my 9mm service weapon, and I think that I over-corrected during my first attempt at firing it. That was kind of embarrassing, since the target was only a few meters away and it wasn't some small, pie-plate sized target. The target was a life-size silhouette of a person, and I missed at close range. The pistol event has three targets and you get five bullets. To get the "gold" rating, you need to put a hole in each of the targets and have five holes total. Fortunately, there was no one behind me and I got to go again. This time, I got 5 for 5. The rifle event was a lot of fun. Normally, I shoot on a 25m range with increasingly smaller targets that approximate a target at a distance. Here, though, we actually went out however-many meters and took up a firing position there. And when we had to move to the next position, we walked side-by-side with the chambered round pointed downrange. It makes sense from an infantry training point of view, but it was quite different from my experience with the US Air Force M-16 training where nobody ever moved from their firing position. I liked firing the G36, but I ended up with a welt over my right eyebrow because the recoil pushed part of the scope mount into it. I fired this course twice as well because I missed the "gold" rating by one round the first time. It just so happened that I was in the last group to go on my second attempt, so I literally made "gold" with my last shot. The machine gun was by far the best part of the day. The MG3 fires 7.62mm rounds at between 1000-1300 rounds per minute. We were given 15 rounds in the first part of the course and 20 rounds in the second part of the course. That's roughly 1 second of trigger pull in each part of the course. It was so fast that I had to be thinking "let go of the trigger" before I actually touched it. The secret with keeping control while firing is to put your body weight into it, bracing the bipod from wobbling while you shoot. Being 200+ lbs, I was a pretty solid shock absorber. The target looked like a three-foot by four-foot drawing out of a child's coloring book, with a little house, some trees, and a field. Hidden in various areas of the drawing were the silhouettes of the bad guys, which were almost impossible to see from the firing line. We had to shoot something like four rounds into each of three targets to "get gold." What was nice was that we were allowed to look at the entire picture up close before shooting, so I picked my targets based on how easily I could triangulate them...I think that one was at the base of the tree, another at the left edge of the house, etc. It was my first time touching one of these weapons and I totally rocked it. The instructor was floored by how tight my patterns were...I may have missed my calling. 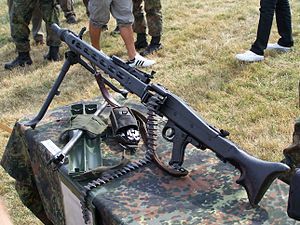 To earn the award, one must successfully shoot the German service rifle (G36), pistol (P8) and machine gun (MG3). The awarded grade is determined by the lowest weapon qualification.(e.g. if you qualify all gold and one bronze, you are awarded the bronze.) Because of how much attention I paid to the rules to ensure that I'd met all the requirements, I was the only American there that day to earn the Schützenschnur in Gold.